Willow and Thatch loves period-inspired things, and knows you do too, so I had a hunch that you’d like to know about this stunning project from Eric Ligon. 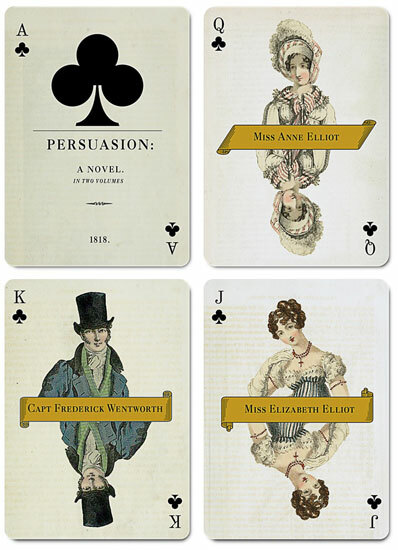 It’s a fully custom deck of playing cards inspired by Jane Austen’s well-loved novels and characters, rich in authentic period detail. You can help bring them to life. 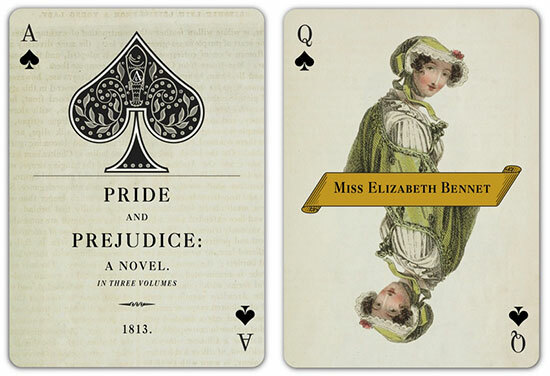 It is a truth universally acknowledged, that a man who has designed a a deck of playing cards in honor of the 200th anniversary of Jane Austen’s passing —using images that Miss Austen is very likely to have seen — must be in want of a way to share them. 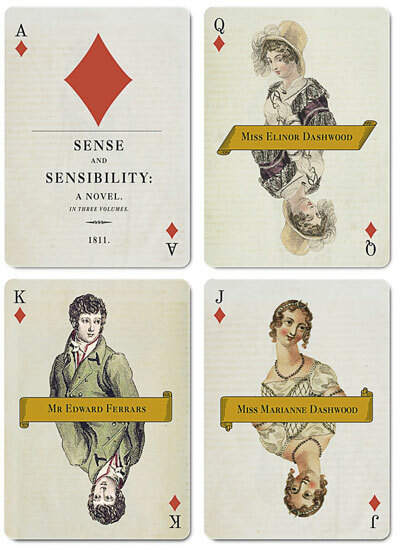 You can order your deck of the first Jane Austen Playing Cards, featuring Pride and Prejudice, Emma, Sense and Sensibility, and Mansfield Park here. You can learn more about this project and see mock-ups of the deck below. Then head on over to the project’s Kickstarter page (link at the end of the post) to order a deck for yourself or as a gift for your favorite Janeite. 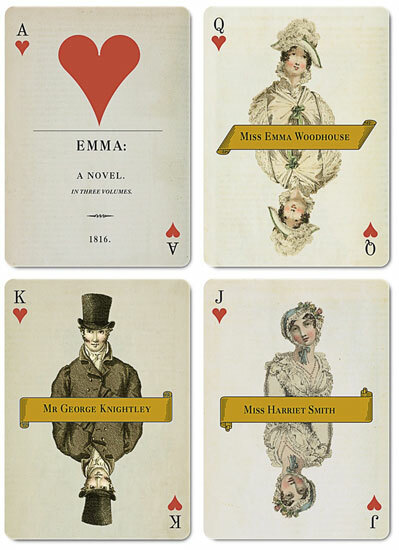 As an avid fan of Miss Austen’s novels, and of novel playing cards, Eric Ligon has designed a deck of playing cards to honor the 200th anniversary of her death. 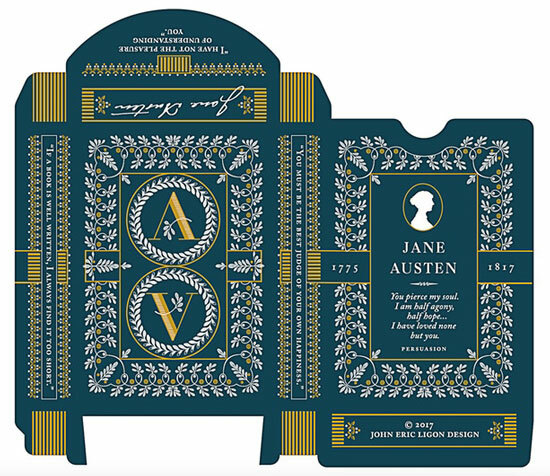 Each suit in this fully custom-designed deck represents one of Miss Austen’s beloved novels, and each suit’s court is represented by the novel’s lead characters. These cards are rich in period detail. The images for all the queens and jacks come from fashion plates found in Ackermann’s Repository of Arts—an influential British periodical published from 1809–1829 that featured articles and images on art, architecture, fashion, furniture, needlework patterns, and politics. It is likely that Miss Austen would have been familiar with this publication. 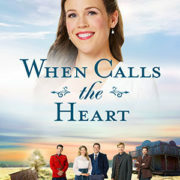 The selection of images for the queens and jacks are found within the two years prior to the publication date of each novel. 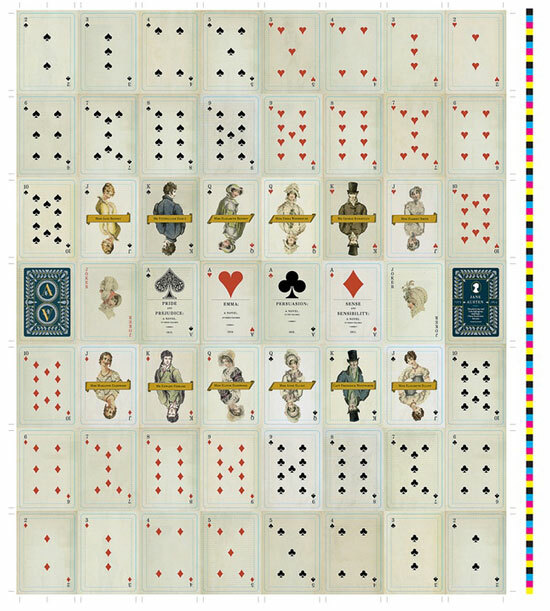 The decorative line art on the back of the cards, and within the Ace of Spades, is based on the needlework patterns found in Ackermann’s. The image of the fish in the Ace of Spades seen above is drawn directly from the mother-of-pearl lottery fish that belonged to Miss Austen and were used as betting pieces in parlour games. These lottery fish are in the collection at Jane Austen House Museum—Chawton House—Miss Austen’s home from 1809 until her death in 1817. You can see a picture of these here. The backgrounds for each court and number card are taken from a multitude of blank pages in Ackermann’s so that the deck looks more authentically antique. The cards will be printed by the United States Playing Card Company and guarantees the quality you expect in a custom deck of cards. 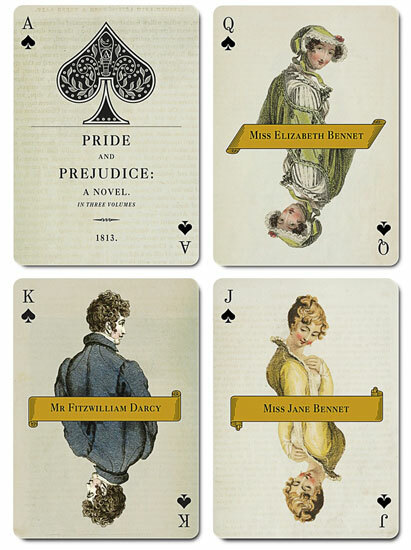 The Tuck Case, like the card back, features line art based on the needlework patterns found in Ackermann’s and is printed in 2 foil stamps and with an emboss on a solid color, heavy weight midnight blue cover stock, and features a quote (“”You must be the best judge of your own happiness.“) from each of the four novels in the deck. One of the Kickstarter rewards is a limited edition uncut sheet from the first deck which features all of the beautiful artwork and illustration from the entire deck in a single 28″ x 26″ poster, similar to the above, that is suitable for framing. You can order your cards here. What carriage gown would you have worn for a ride in a phaeton through the Hyde Park in April 1826? Choose any month in any year between 1821 and 1828 and find the most fashionable attire in England. 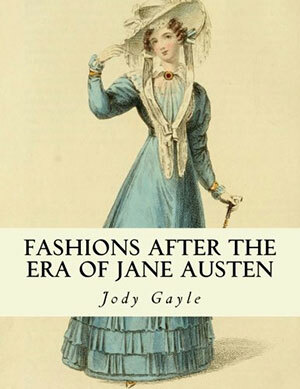 Fashions After the Era of Jane Austen is a comprehensive pictorial guide of ladies’ fashions collected from one of the most influential periodicals of Austen’s lifetime – Ackermann’s Repository of Arts. Ackermann’s Repository was published in London nearly two hundred years ago and it provided ladies with monthly etchings of exquisite hand-painted plates featuring the latest fashions. Discover splendid illustrations of morning, evening, riding, and walking dresses with their coordinated accessories: hats, shoes, scarves, jewelry, parasols and more. The book contains nearly 200 exquisite illustrations which are accompanied by the original descriptions, as published nearly two hundred years ago. Costume designers, researchers, authors, and fashion lovers will all treasure these authentic examples of fashionable dress after the era of Jane Austen. 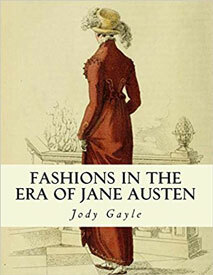 Fashions After the Era of Jane Austen covers eight years of fashion in the Georgian period (1821-1828). If you enjoyed this post, be sure to visit The Period Films List, after you leave your questions for Caroline and enter the giveaway. You’ll especially like the Best Period Dramas: Georgian and Regency Eras List. And be sure to see this list of Jane Austen Gifts and read this post about the costumes in five different adaptations of Pride and Prejudice. You can also see more period-inspired lovely things here. I am interested in the playing cards but will you be shipping to Australia? Ruth, I will be shipping to Australia. I hope you’ll back the campaign!